Lawyers for both Philadelphia crime figures filed motions challenging pre-sentence reports that suggest each should be sentenced to from 17 to 21 years in prison for their February convictions on racketeering conspiracy charges. Their lawyers argue the guidelines should be in the four- to six-year range. Ligambi's lawyer wants to insure that the criminal charges for which the jury found Uncle Joe not guilty in February can't be used to support the conspiracy charge central to the retrial that is to begin Oct. 15. Borgesi's lawyer, meanwhile, is trying to have the conspiracy count -- the only remaining charge against his client -- thrown out, arguing that since Borgesi was acquitted of 13 specific criminal charges in the first trial, there is nothing left to support the conspiracy count. Prosecutors this week asked for a second extension of the deadline to file a response. They now have until June 17 to reply. In arguing that the case against Borgesi, 50, should be dropped, Christopher Warren wrote that the racketeering conspiracy charge is based on the same criminal allegations detailed in the 13 counts for which Borgesi was found not guilty. To convict Borgesi in the pending trial,. Warren argued, the government would have to prove that "he conspired or agreed...to commit the same substantive racketeering offenses that the jury had already decided he did not conspire to commit." Both Warren and Ligambi's attorney, Edwin Jacobs Jr., cite the legal argument known as collateral estoppel and a U.S. Supreme Court ruling on that issue that, according to Jacobs, "protects a defendant who has been acquitted from having to run the gauntlet a second time." Jacobs argued that the racketeering conspiracy charge against Ligambi, 73, cannot be presented to the jury in the retrial based on any of the extortion or gambling charges for which the jury found him not guilty. In Ligambi's case, the jury was hung -- or was undecided -- on the racketeering conspiracy charge, on two counts tied to the operations of an illegal video poker machine business and on one count of witness tampering. He was found not guilty of extortion, bookmaking and fraud charges. The counts on which the jury hung are the only crimes that the prosecution should be permitted to present in support of the conspiracy charge, wrote Jacobs, who once again cited the overall jury verdict as a vindication for the defense, even though several defendants are facing serious jail time. In his analysis, Jacobs wrote: "After an almost four-month trial, including 21 days of deliberation, the jury rejected more than ninety-percent of the allegations constituting the `pattern of racketeering' alleged by the government. Of the 61counts alleged in the government’s Third Superseding Indictment, only five resulted in convictions. Of the remaining counts, 45 resulted in acquittals and 11resulted in a hung jury. The jury failed to convict (Ligambi) on any of the nine counts for which he was charged, acquitting him of five counts and failing to reach a decision on the remaining four counts." Borgesi's numbers are even more lopsided. As Warren noted, he was acquitted of 13 counts and the jury hung only on the racketeering conspiracy. What's more, Warren argued, the government's case against Borgesi was built primarily around the testimony of mob associate Louis "Bent Finger Lou" Monacello who testified that he ran a gambling and loansharking operation for Borgesi after Borgesi was convicted and jailed in an unrelated racketeering case in 2001. The prosecution contends that Borgesi primarily conspired from behind bars. He has been in jail since March 2000. His scheduled release on a 14-year prison sentence was delayed when he was indicted along with Ligambi and the others in the current case in May 2011. Whether Monacello, 44, is back on the stand at the retrial is an open question that continues to circulate in both law enforcement and underworld circles. 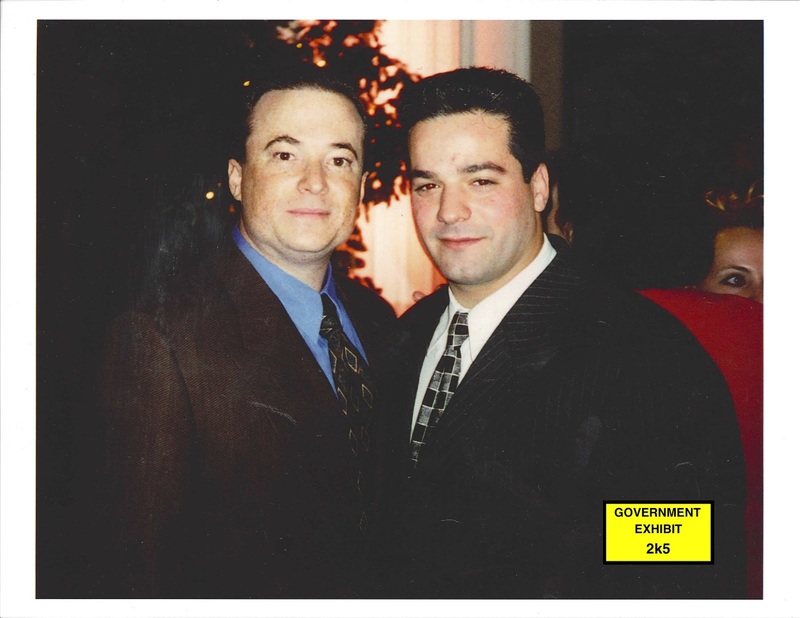 Indicted with Ligambi, Borgesi and the others, the brash talking wannabe wiseguy left South Philadelphia after becoming a cooperating witness and pleading guilty to the same racketeering conspiracy charge that Ligambi and Borgesi are now fighting. From the witness stand, his animosity toward both men was palpable. He never missed an opportunity to chide or belittle either defendant and claimed that he was cooperating because he believed Ligambi planned to have him killed and Borgesi, once he had returned from prison, would have carried out the hit. He also alleged that Borgesi once boasted that he had been involved in 11 gangland murders. "I would have gone out one night and never come back," Moncello told the jury. The defense, both during the trial in in post-trial motions, has argued that Monacello's testimony was unbelievable and, more important, was rejected by the jury. Warren, in his motion, noted that Monacello's role in the bookmaking and loansharking operation was never in dispute. Monacello admitted it. But, the lawyer said, the jury's verdict clearly indicated that it did not believe his testimony linking Borgesi to those crimes. The only conclusion that could be drawn from the jury's verdict, Warren argued, "is that no such conspiracy or agreement between Mr. Borgesi and Monacello to commit these offenses existed and that Monacello was acting on his own." Just what evidence the government intends to offer to support the conspiracy charges should be part of the prosecution's motion due next week. The sentencings of Massimino, Canalichio, Anthony Staino and Gary Battaglini, meanwhile, have been rescheduled for July. Massimino, the reputed underboss, goes first. His lawyer, Joseph Santaguida, filed a motion earlier this month challenging the sentencing guideline range and the argument that Massimino is a "career offender," a designation that enhances his guidelines. As he had during the trial, Santaguida called the government's case "a cinematic fiction" built on the the frustration of law enforcement for its failure to develop a more significant racketeering indictment despite a 10-year investigation. Santaguida said the indictment was "nothing more than a glorified gambling case" and that the government was "forced to blow these acts out of proportion because they wasted millions of tax dollars and resources" in the decade-long probe. Both lawyers cited the lack of specificity in the jury's verdict to argue against a government interpretation that the two defendants were major mob operatives and part of a broad conspiracy. Massimino, 62, is scheduled to be sentenced on July 11. Canalichio, 43, will be sentenced on July 16. Battaglini, 52, and Staino, 55, on July 17. In the latest development in the case, Robert Ranieri, 37, entered a guilty plea today to an extortion charge and avoided trial. He is to be sentenced in September. Ranieri and Eric Espositio, charged with bookmaking, were severed from the original trial. Esposito is now scheduled to be tried with Ligambi and Borgesi in October, but several sources say he too is likely to enter a plea. While defense attorney continue to tout the case as overblown -- Jacobs has referred to it as "racketeering lite" -- prosecutors point to the results. Assistant U.S. Attorney Frank Labor noted at the end of the trial in February that most of the defendants in the case had either pleaded guilty or been convicted. Of the 14 original defendants, six have pleaded guilty and four were found guilty at trial. Only Joseph "Scoops" Licata, 71, was found not guilty and is free. So while defense attorneys continue to point to a jury verdict that "gutted" the prosecution's case, most of the defendants are in jail. And in the cases of Massimino and Canalichio, they could be there for a very long time.